You guys. Thanksgiving is tomorrow and I feel completely unprepared for the marathon of cooking that lies ahead of me. 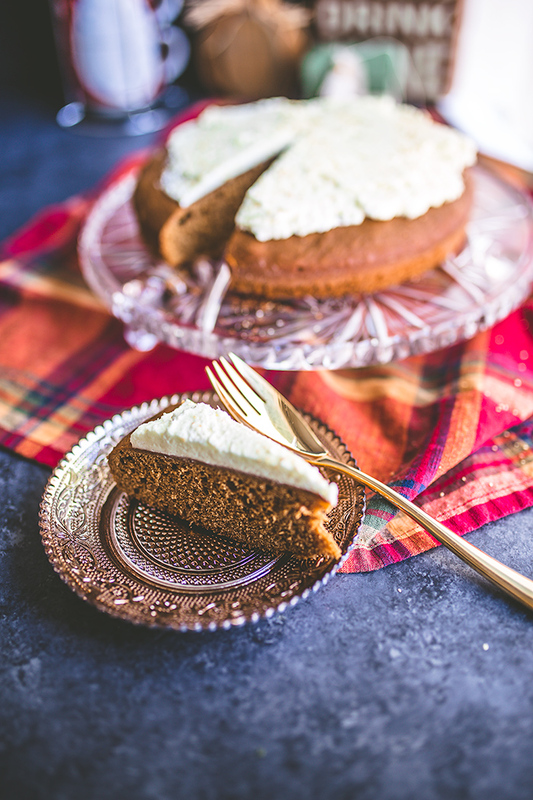 Fortunately, the one thing I am not worried about is dessert because this gingerbread cake with an incredibly delicious and simply lemon curd whipped cream topping is on the menu. Initially, I had every intention of making a fabulous two-fer pie (is it pumpkin? is it pecan? it’s both! ), however a family emergency took priority over an afternoon of baking. Fortunately, this cake is an excellent plan b and comes together in a fraction of the time that a traditional Thanksgiving pie takes… but as I glance over at my freezer, I am reminded of the frozen discs of dough I have waiting for me. Since I am spending Christmas in New York for the second year in a row, Thanksgiving is the only time I’ll be seeing the majority of my family in a somewhat formal setting, so I want to make sure everything is dialed in and perfect. Fortunately, the turkey stock has been made, the gravy is sitting on the counter cooling off waiting to be transferred into its overnight home and the turkey breast is chilling in a delicious buttermilk brine. Everything has just seemed so off this year. Maybe it’s because we’re eating one of the two turkeys we raised from the time they were two days old, and even though I don’t miss the giant turkey poo land mines in the yard, I do sort of miss being greeted by the hen. (Tom’s are assholes—he got sacrificed the start of October because I’d simply grown tired of being chased around my yard.) I’m hoping my husband learned his lesson and won’t walk in the door with two more adorable day old turkeys next spring. At the end of October, coinciding with the anniversary of my mother-in-law’s passing, my father-in-law’s health really went downhill rather quickly. After being diagnosed with Parkinson’s around 12 years ago, his symptoms have suddenly become exponentially more evident, which I have been waiting for, hoping the day would never come. But it has, and now the greatest challenge lies ahead. I’ve experienced loved ones battling (and losing their battles against) cancer, multiple sclerosis, being old and generally have their bodies begin to fail them, but this Parkinson’s journey is something I never would wish on even my greatest enemy. From the sudden personality changes (hello temper tantrums and sneakiness), to the physical limitations of watching a grown man struggle to get out of bed just to use the bathroom in the middle of the night… it’s just an overall exhausting experience and I know we are just starting the downward spiral. Recognizing that this could be the last Thanksgiving we have with my FIL where he is cognitive and able to eat on his own, the pressure is on to make everything perfect and enjoyable for him. The wines have all been selected and are waiting in the wine fridge, waiting to be freed from their bottles. Maybe, just maybe, I have taken on a little more than I can handle, hosting wise, but I like to think I’ve been training my entire life for this one day… One day of cooking everything by myself. I’m crazy, right? As I mentioned earlier, the one thing I have going for me is this gingerbread cake. It’s unlike any other gingerbread recipe I’ve ever made before. The grated, fresh ginger takes this cake from delectable to superb. It’s also incredibly easy. So easy in fact that I asked my husband to test it out for himself and guess what. He didn’t burn it and it tasted just as good as when I made it. How impressive is that?! I have taken to making this cake with a generous serving of whipped cream. Slightly sweetened whipped cream is fine, but I absolutely loved the addition of store-bought lemon curd to the whipped cream. There’s a reason why ginger cookies are filled with lemon… They taste so good together. Pop the cake into the oven just as you’re sitting down to eat dinner (it takes about 35 minutes to cook), remove it from the oven to let it cool slightly, and once people have signaled they’re ready for more food, whip up the heavy cream and bam. Dessert is served! If you love gingerbread year-round, you’ll also love my recipe for fluffy gingerbread pancakes. I hope everyone has a fantastic Thanksgiving, and has a safe and sane Black Friday! Classic gingerbread is dressed up with freshly grated ginger and an easy lemon curd whipped cream topping. Preheat oven to 350º and lightly grease a 9-inch round cake dish and dust with flour.In a small bowl, sift together the flour, baking powder, baking soda, ground ginger, cinnamon, nutmeg, and salt. Set aside.In the bowl of a stand mixer on medium speed, cream together the butter and sugar. Once light and fluffy, add the eggs, one at a time. Add the grated zest and grated fresh ginger. Slowly add the molasses. In portions, add the flour mixture and mix until just combined. Stir in the water. Pour the batter into the prepared pan and spread evenly with a flat offset spatula.Bake until the cake is puffed up and a toothpick inserted into the middle comes out clean, approximately 35 minutes. Transfer to wire rack to cool slightly.While the cake is cooling, add the heavy whipping cream and confectioners sugar and beat until stiff peaks form. Stir in the lemon curd, swirling it into the whipped cream. Dollop onto the center of the cake or serve in a bowl for people to add their own. Serve cake warm or at room temperature.